To The Bitter EndGames are often left unfinished. Sometimes they’re too difficult, too vast, or too repetitive to see all the way through to the closing credits. To The Bitter End is our look at those endings that are worth fighting for—or at least worth reading about. Lee Everett is a dead man walking. In the finale of Telltale’s The Walking Dead: Season One, he is tasked with tracking down his young charge Clementine and rescuing her from a deranged kidnapper. But he’s been bitten by a zombie, and by the time Lee has saved Clem from her abductor, he already has one foot in the grave. The game’s denouement sees him guiding Clem through the process of restraining him in case he should turn and escaping the store in which they’ve been trapped. The final decision presented to the player is to have Clementine shoot Lee in the head to prevent him from reanimating, or leave him to become a zombie. It’s an impactful choice in a game full of them, but it also can’t help but feel more symbolic than practical. Lee is going to die either way, what difference does it make whether he is executed or reanimated? The truth is, this decision isn’t about how Lee’s story ends. It’s about how Clementine’s begins. The season has been leading to this decision, repeatedly demonstrating what the ramifications of this choice will be for Clementine. Telltale’s The Walking Dead has insisted that the most vital skill for an apocalypse survivor is the ability to accept loss and move on. When you decide whether Lee tells Clementine to kill him or leave him, you’re choosing to tell her what sort of person she should be in order to face the world alone. Several characters lose their families over the course of the season, and their responses to that loss mark them as either heroes or villains. In Episode Three, Lee discovers that Ben, a member of his group, has been offering supplies to bandits who attack your makeshift home when they feel they’ve been shorted. During the group’s escape, a zombie bites Duck, a 10-year-old kid. His father, the cranky-but-well-meaning Kenny, at first insists that Duck can be saved but eventually concedes that he needs to be killed. You can even insist that Kenny kill his son himself. For a while after losing Duck, Kenny retreats into solitude and alcohol, but he eventually rededicates himself to the group, his surrogate family. At the end of the season, depending on the choices you’ve made, he can even risk his own life trying to save Ben, the character whose actions indirectly got his son killed. By contrast, Lilly, the de facto leader of Lee’s group, betrays them in Episode Three after the loss of her father Larry. While imprisoned in a meat locker with Lee and a few others (long story) Larry had a heart attack. Kenny, coldly but rightly, pointed out that if Larry were not properly dealt with, he would reanimate and attack them. Lilly refused to listen, so Kenny went behind her back and crushed Larry’s head with a salt lick. After losing her father, Lilly becomes cold and paranoid, resenting the group instead of recognizing them as a potential new family. After the group flees from the aforementioned bandit attack, she murders the character she wrongly believed was responsible. If you permit her to rejoin the group, she goes on to steal their RV and abandon them. 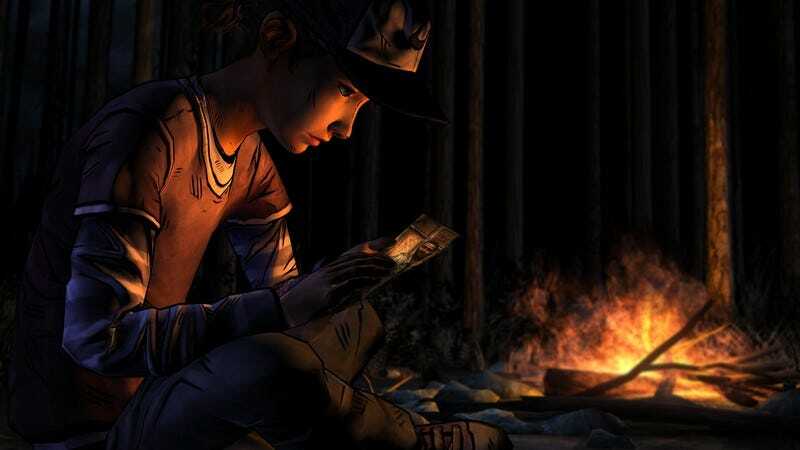 The vital importance of coping with loss is crystalized in Lee’s confrontation with Clementine’s kidnapper, a character known only as the Stranger. Lee and the Stranger are set up as reflections of one another, would-be surrogate fathers to Clementine who are haunted by past failures. Both have lost their families—Lee’s parents and brother are found dead in Episode One, and the Stranger’s wife and daughter abandoned him and later died after Lee’s group stole from their car. All that sets Lee and the Stranger apart is how they coped with that loss. Lee personally euthanized his zombified brother, moving on from the past to his new surrogate family with Clementine. The Stranger, though, carries his wife’s reanimated head around in a bowling ball bag. His dead family is literally his baggage, and he clings to it until it drives him mad. In The Walking Dead, the world is fundamentally changed, and characters need to change with it, not just to survive, but to retain some shred of decency. The past is a burden on these characters, and detaching from it will enable them to better integrate into the groups of survivors that are the new families of this world. The zombie-apocalypse setting allows for an especially clear metaphor for that dangerous attachment to the past: In a world where the dead return to feast on the living, somebody’s past can literally come back to hurt them. Killing the undead, especially undead friends and family, becomes the surest sign they accept that the old world is gone. Refusing to accept this new reality—clinging to the old world’s relationships and rules—drives these characters to be reckless, selfish, and antisocial. That brings us back to Clementine. Only after she is rescued from the Stranger does she learn that her parents are dead, something she has refused to believe since the moment Lee met her. Now, she is losing Lee too. In this moment especially, Lee stands in for Clem’s parents. He takes this opportunity to give her some parting advice—never get trapped, stay out of cities, keep your hair short—but his final instruction is what determines who she will become. If she kills Lee—breaking with the past and accepting the new world—Clem becomes more like Lee and Kenny. If she clings to the past and leaves him, she risks becoming as selfish and dangerous as Lilly and the Stranger.